The galaxy has been taken over by the Bacterian Empire, and you, a lone star pilot, must take them down using a formidable new craft known as the Vic Viper. With each new area you liberate from Bacterian forces, you also face a larger threat, each with a core defense system that forces you to target their weak points. Along the way, you'll face mechanized enemy forces, strange Moai creatures that can shoot laser rings at you, and enemies that seem to appear from nowhere, all of whom are bent on your destruction. Power up your ship quickly, with bombs, lasers, and optional companions that increase your firepower, lest you fall in battle and allow the Bacterian forces to rule the galaxy. Jump into the cockpit of the Vic Viper, and save the galaxy! 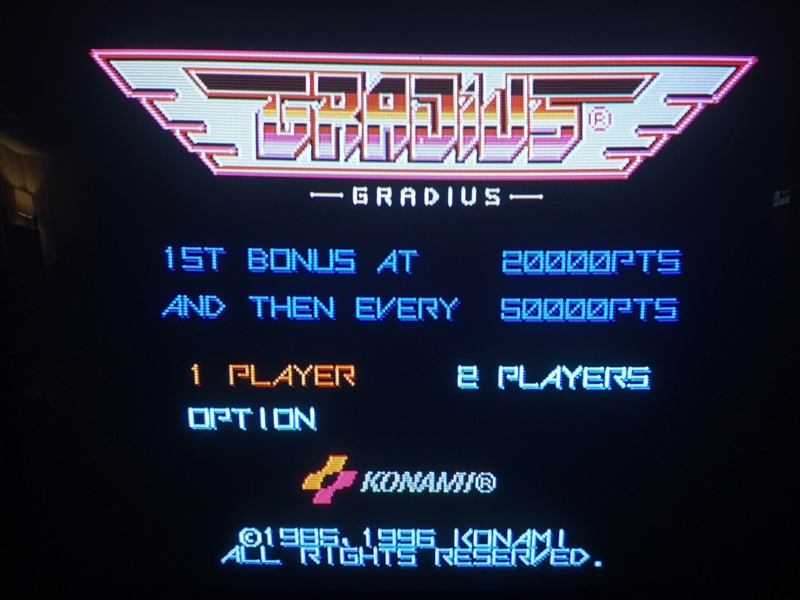 Gradius is an arcade shoot-em-up, released in Japan by Konami in 1985, which came to the West as Nemesis. It was originally developed as a follow-up to the earlier Konami scrolling shooter hit Scramble, but quickly outgrew that inspiration to become its own unique title, spawning a long-running series of successful, and well-loved games. It's unique power-up system became a major attraction for the game, and subsequent titles in the series expanded upon that formula in a number of unique and interesting ways, all while keeping the core functionality that was so ground-breaking upon its release. Gradius also introduced the "core" mechanic, whereby the enemy bosses had a specific weak point, or core, that you had to destroy, in order to take them down. Each of these cores were usually protected by a series of shields, so you had to work to remove those barriers before you could actually damage the bosses. 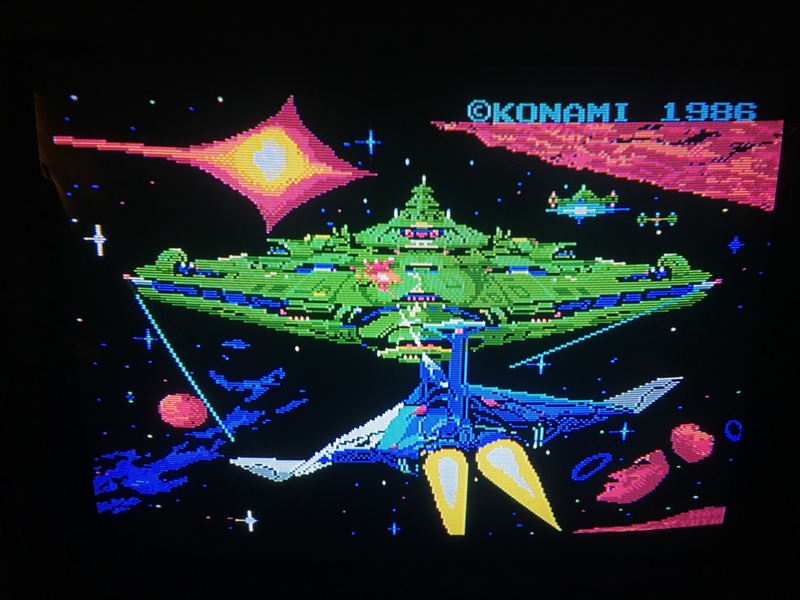 The colorful, detailed graphics, memorable soundtrack, and interesting game play mechanics all combined to make a great game that still inspires today, as seen by the recent release of Super Hydorah, a game that borrows heavily from the formula this game established. 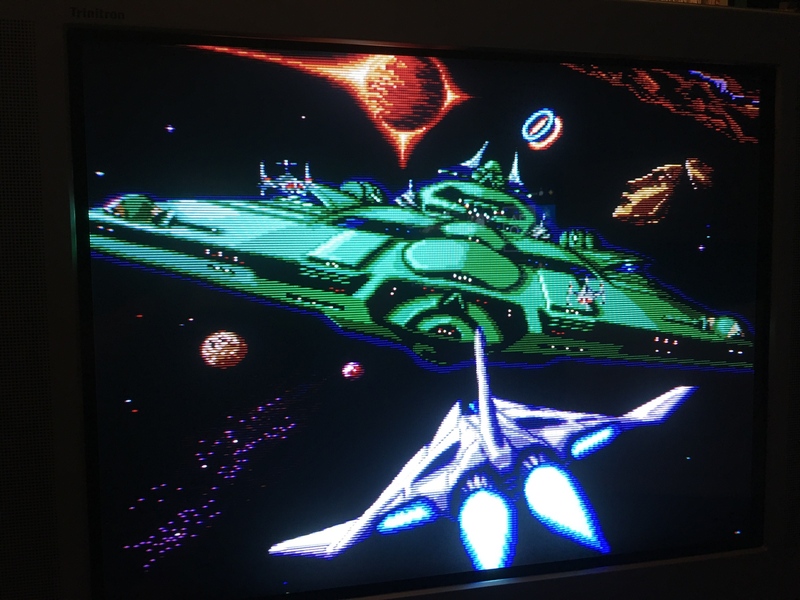 Gradius received a port on the NES, as well as several microcomputer platforms, the PC Engine in Japan, and the Sega Saturn in Japan as well. 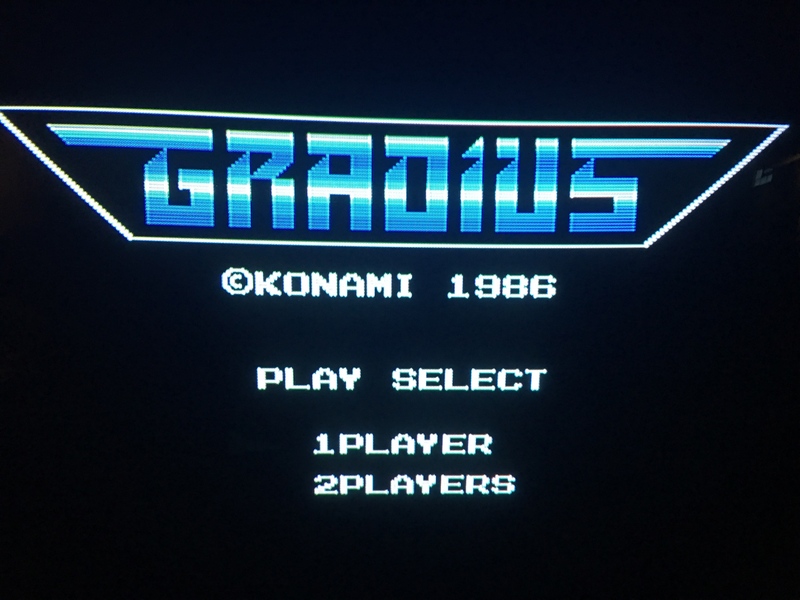 The US didn't see another release of the original game until the Gradius Collection on PSP, which is a direct arcade port. More recently, the game has been made available on the PS4 under the Arcade Archives line, with the ability to play the JPN, US, and EU specific iterations of the game. 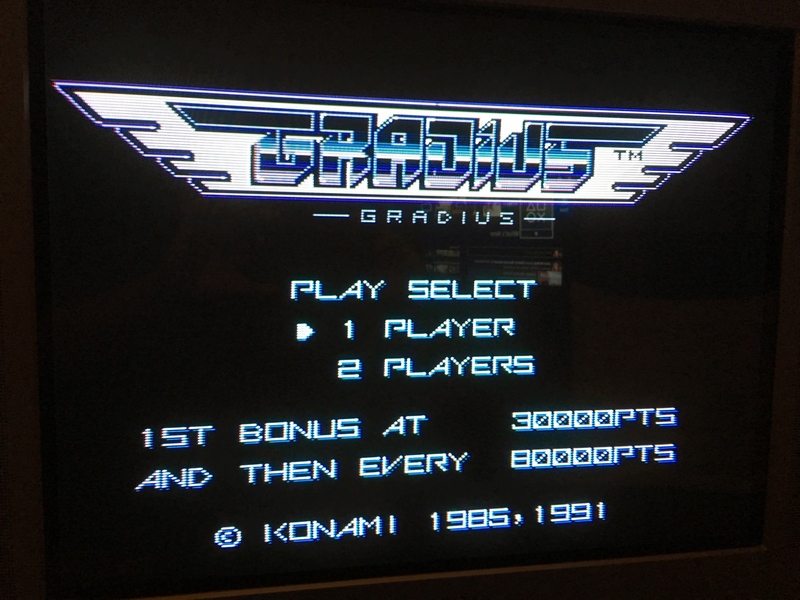 Join us in July for the RF Generation Shmup Club's second game, Gradius! Pick your version, and let's get blasting! The Gradius Deluxe Pack was also released for Windows in 1997, so presumably, it works with Windows 95 and 98. Indeed! Any guesses as to which game we might be playing? I'll take any in that series. Sorry, not this time. I would have used, erm, *other* hints if it were that particular off-shoot of the series. Woohoo! Any thoughts on which version(s) you might want to play? I have a famicom, nes and psp. I think I'll go for nes. I will play this! Most likely the NES version, though I might give the PC Engine version a shot (on the RetroPi). I ran a test playthrough last night to make sure everything was working correctly. Very cool! Thank you for the participation heads-up, everyone!